Is This Jürgen Klinsmann-Fabian Johnson Thing Really A Thing? For the first time in his largely stress-free tenure as USMNT manager, Jürgen Klinsmann is facing real scrutiny about his job performance. And while it hasn’t been exactly fashionable to take aim at him until now, the press and fan responses to his current dilemma are inextricably linked to their pre-existing feelings about his statements and actions. Everything involving Klinsmann and the USMNT is a kind of Rorschach test that reveals your inner sense of the coach and the team. Mexico beat them 3-2 in a playoff game for the rights to play in the 2017 Confederations Cup. 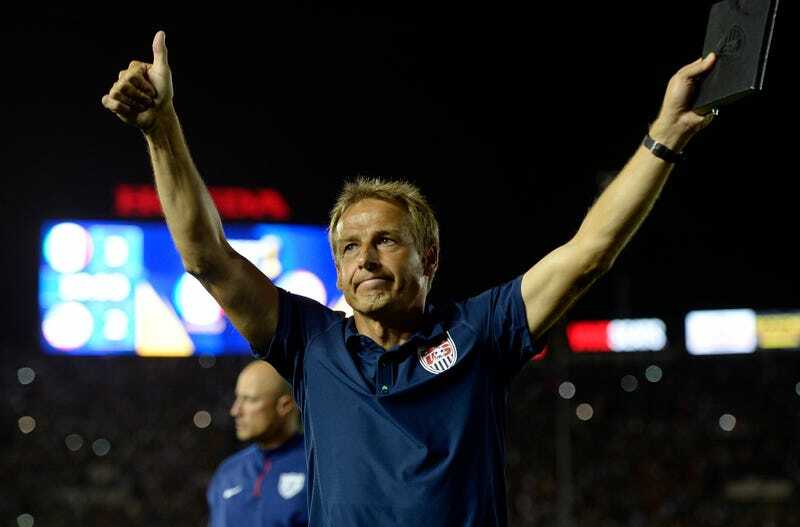 Was it a must-win match against the archrival, and the failure evidence of Klinsmann’s charisma-rich, tactics- and strategy-poor coaching deficiencies? Or was it a clearly more talented team doing what they should, and proof that the American roster, even four years into his tenure, is still only at phase two or so of the multi-stage plan he was hired to implement? Klinsmann was brought on precisely because he had the credibility to state uncomfortable truths and the charm to sell the public on them. Many fans, media members, and U.S. Soccer bigwigs, though, haven’t taken kindly to the blunt talk. This means that every controversy is about something more, or other, than itself; they’re all, at root, about whether Klinsmann is right about whether the American way of soccer needs to change. The newest inkblot for everyone to stare at comes in the form Klinsmann’s treatment of Fabian Johnson, who is, right now, probably the best player on the USMNT. At the very least, he’s having the best career moment. The German-born American is a regular starter for Borussia Mönchengladbach, a club that this season plays in both the Bundesliga, one of Europe’s best domestic leagues, and the Champions League, the world’s most prestigious tournament. In age, heritage, career trajectory, talent, and drive, he is basically the embodiment of everything Klinsmann has said he wants in a U.S. international. Which makes it strange that Klinsmann went ahead and trashed Johnson in the media and sent him home after Saturday’s loss. All of this stems from the Mexico game itself. There, deep in extra time, Johnson signaled to the bench that he needed to come out of the game. Johnson has fought a number of hamstring and calf injuries in recent times, so the fear was that one of those had sprung up on him again, right when he could least afford it. Klinsmann subbed out his full back in the 111th minute for Brad Evans, and Mexico scored the winning goal seven minutes later. Basically, Klinsmann accused Johnson of exaggerating his injury so that he could get out of the game. This is obviously really bad. Johnson had already missed more than a month of this season due to the aforementioned calf injury, so it makes perfect sense that he would be sensitive to any potential subsequent injury. And as everyone knows, the fight for minutes on the best teams is cutthroat; while Johnson enjoys favored status with Gladbach right now, there’s no telling whether someone would take his job should he miss more time. This may be little solace to Klinsmann, whose primary focus is on the national team, but Johnson’s own loyalties should definitely lie firmly with his club career. That said, the reaction to this has been a little extreme. Take that Grant Wahl SI article quoted above. Under the headline “Klinsmann throws Johnson under bus ahead of friendly against Costa Rica,” Wahl brings up multiple instances of what he describes as Klinsmann throwing players under the bus, characterizes the coach’s decision-making as irrational (the phrase “for some reason” makes a couple appearances), and claims that Klinsmann is trying to deflect blame for his team’s poor performances away from himself and center it on the players. Wahl slams about Klinsmann as hard and blatantly as he claims Klinsmann slammed Johnson. Wahl is probably the American journalist most in touch with all the major players in American soccer, so when he comes out this strongly against Klinsmann, it’s saying something. Explicitly, it says that the whispers of player discontent at Klinsmann’s demanding nature and repeated use of public shaming have now grown fairly loud. Implicitly, it says that Klinsmann is broadly right; American players and the greater U.S. system so abhor strong criticism and the kind of accountability seen in the international game at its highest levels that they’d rather have a coach who doesn’t call anyone out even if that’s exactly what they hired him to do. Klinsmann’s words were undoubtedly bad from the perspective of Johnson’s larger career. But no one can honestly believe they’re all that different from what the boss of any serious national team would say in a similar situation. Just last season, José Mourinho and Vicente del Bosque got in a little tiff about who should decide when Diego Costa should or should not be called into action that could threaten his sensitive hamstrings. Argentina’s Gerardo Martino practically only has his job because Lionel Messi likes him and yet even he has made coy comments about the G.O.A.T. potentially rushing his recovery from his recent injury to hopefully make it back in time for a couple critical World Cup qualifiers. Right now, Real Madrid blame France’s coach for letting Karim Benzema get hurt on his watch. No one realistically believes this kind of self-interested behavior is grounds for these nations’ respective managers to get canned, because you’d have to be pretty naïve to assume they’d behave otherwise. There, ESPN’s Jeff Carlisle says it wasn’t only Klinsmann that was upset with Johnson, and that his teammates were also mad at him. Also consider that it’s unlikely Klinsmann would seriously feel the urge to deflect blame for the loss away from himself when the loss was clearly a result of Mexico having better players—and that no matter how many people he’s pissed off, his job is still safe for the foreseeable future. In the end, this is another Rorschach test. Is Klinsmann a petty tyrant who can’t get along with big-name players, out to humiliate players to serve his own ego? Or is he making a point of calling out his favorite son in front of everyone, proving that he demands the same standard of commitment from every player in service of trying to orient the team toward excellence? As is always the case with these sort of situations, the way you see them says more about you than it does anything else.